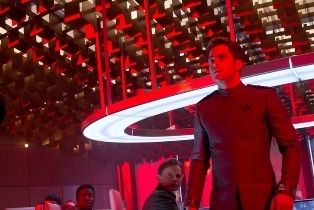 Star Trek Into Darkness has been a source of contention among moviegoers during the summer of 2013. Defenders of the film cite the fast-paced story, exciting action, and the fresh take on the classic characters. Detractors feel the action-based film destroys Gene Roddenberry’s, the creator of Star Trek, vision of exploration and peace. When asked about the J.J.Abrams films, Next Generation actor LeVar Burton said that ultimately Star Trek is about hope. He felt that was missing from these reboot films. 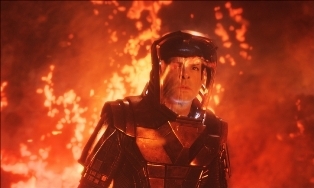 However, the main source of debate about Into Darkness revolves around the retread of The Wrath of Kahn. Should Abrams have trampled all over one of the most (if not the most) celebrated Trek films, when he could have done anything he wanted? My answer is no. While I enjoy the film, the ending makes me cringe. Here at Cinema Lowdonwn, we have already spent a lot of time discussing the pros and cons of this film, so I’m not going to repeat the same things. The first time around Chaz said the film “sinks like the Titanic” at the end. One the second theatrical viewing, I was reminded of all the things I liked about, but still found the ending disappointing. So now the film is out on Blu-ray and we have watched it for the third time. I pretty much feel the same way about it. It’s fun, it’s exciting, the story is pretty good, but I hate the ending. Not just that they reversed the ending of Wrath of Kahn, but the entire thing. Do we need to see Spock going mano-a-mano against Kahn? A generic chase through a partially destroyed city is just a little too ordinary for Star Trek. Didn’t we already see it in so many other action films this year? I hope Abrams can do better next time around. 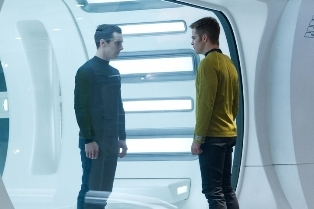 I love Chris Pine as Kirk, Zachary Quinto as Spock, Karl Urban as Bones, and Simon Pegg as Scotty. They are what make me want more of this Star Trek. On Blu-ray the film looks and sounds great. Into Darkness is a colorful film and the colors are vividly rendered. Every scrap of debris is clear in the bombed-out Starfleet library. The bridge, engine room, and sickbay of the Enterprise shine through in spectacular detail. I really can’t complain about anything to do with the audio-visual presentation. What I can complain about are the special features. Where are they? For a release like this I was expecting something a little more fun and informative than a few technical featurettes. Yes, it’s interesting to see that Nirbiru was actually a practical set and not entirely a special effect, but where are the deleted scenes or a commentary track from Abrams? The featurettes total about 45 minutes, which I great, but it’s all a little tedious. The lack of fun special features is the most disappointing aspect of this set. 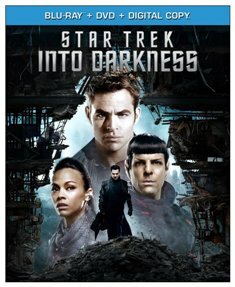 After three viewings, I can say that I’m sticking with my mixed feelings about Into Darkness. Great start, great performances, but a disappointing ending also ruins this film.